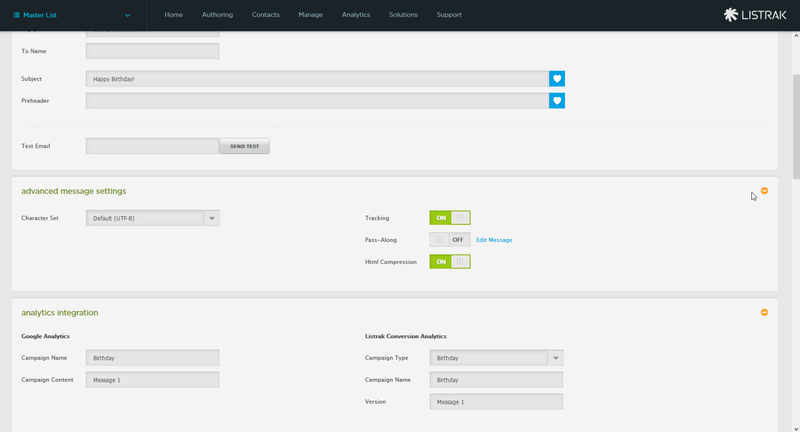 Learn more about how to set up an Birthday Campaign with Listrak. A Birthday Campaign is a great way to reach out to your customers and recognize them on an individual level on their special day. If you'd like to include a coupon in this message, please follow the coupon segmentation fields section. Otherwise, you may skip this step. The birthdate field in this article is named BirthDate. If you're using a different name for this field, please ensure that it is set as a Date data type and use this field consistently throughout this article. If you already have a birthdate field created, please move to the external events section. This field will be used again to move current subscribers who currently have a birth date in their profile. This is covered in Adding Existing Subscribers to Your Birthday Campaign. 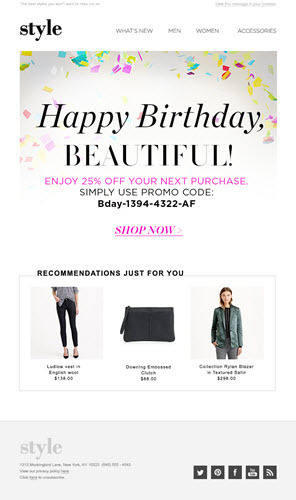 You may want to create a coupon field using the similar steps below to include coupons into your Birthday Campaign. Click here to learn more about how to add coupons to a conversation. Enter Birthday Campaign for the Field Group Name. Enter BirthDate for the Field Name. Select Date (mm/dd/yyyy) in the Data Type drop-down menu. Creating an external event here allows subscribers to receive their birthday message and be re-entered into the conversation to receive the message next year. The second event is to add your existing subscribers into the conversation. An explanation of this is covered in greater detail in Adding Your Existing Subscribers to Your Birthday Campaign. Enter Birthday Reentry for the Event Name. Select Birthday Campaign from the drop-down menu for the Group. Repeat the above steps and enter Existing Subscribers as the Event Name. This will be used when adding your existing subscribers. NOTE: It is recommended to create external events for each subscription point on your website, so those subscribers can be entered into your Birthday Campaign. 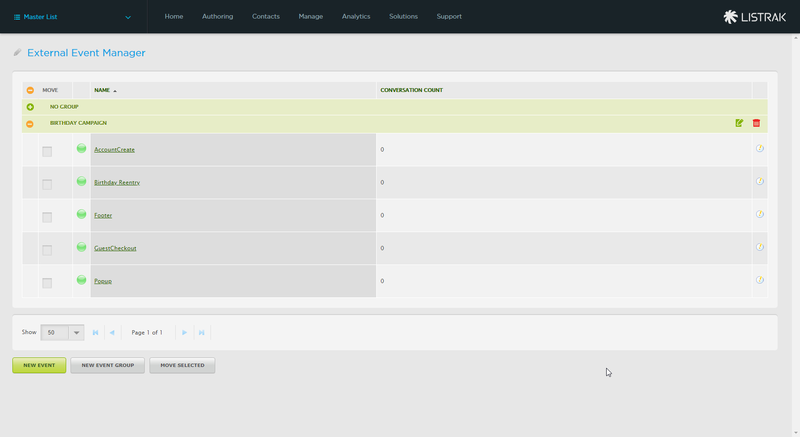 Click here to learn more about setting up subscription points and external events. Below are the resources necessary to create your Birthday Campaign message in Listrak Composer. Please use the below materials to make a Birthday Campaign message unique to your brand. Adding Coupons to your Birthday Campaign message. 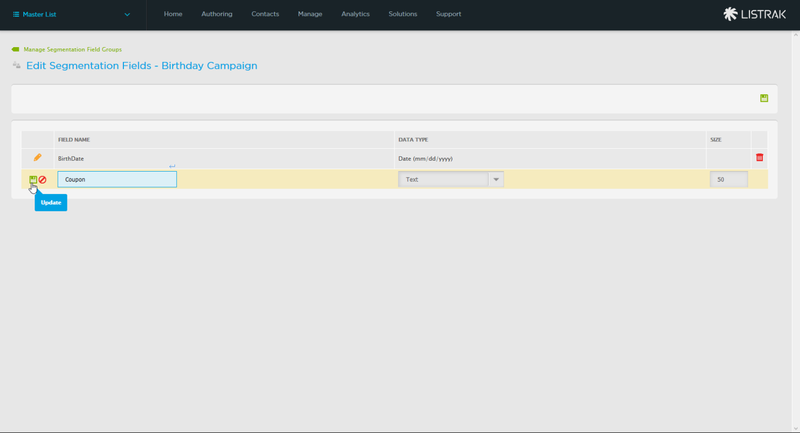 After you've finished building and testing your Birthday Campaign message, you are ready to build your automated campaign in Listrak Conductor. 1. Select the Master List from the drop-down menu. 6. Enter Birthday Campaign for the New Conversation Name. 7. Select the Birthday template from the drop-down menu. 9. Click the first Trigger Step called Birthday Trigger. 10. Click the + icon to assign all of the subscription point external events that ask for a contact's birthdate. 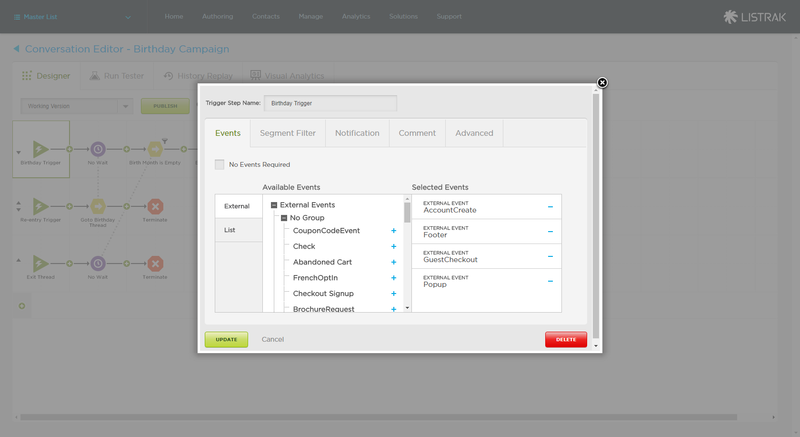 The applied events appear under selected events. 12. Click the Birth Month is Empty GoTo step. 13. Click the Segment Filter tab. 15. Apply the following filter: Segmentation Field Groups, Birthday Campaign, BirthDate, Is Empty. 16. Click Update twice. If there's no BirthDate, contacts will reach the Exit Thread and will be removed from the conversation. Wait Type: Select Next Matching Date with Segmentation. Wait until the next matching: Select Year. 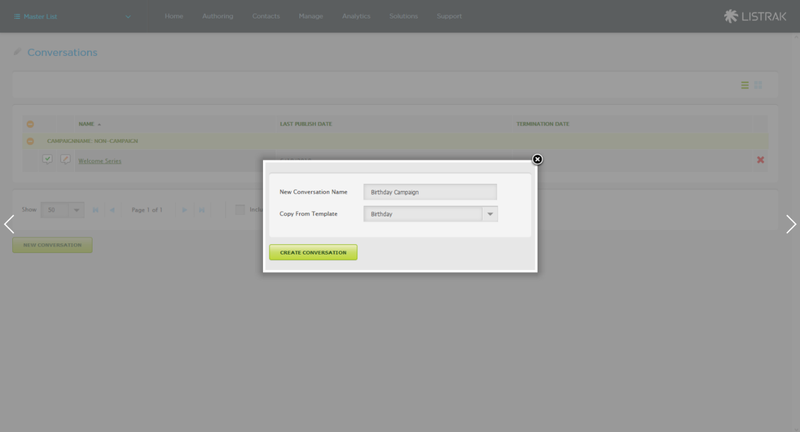 Based on the segment field of: Select the BirthDate field previously created and a time to send the message. Using the offset of: This field is only applicable if you want to send the message on a different day other than what is in their BirthDate field. Use an offset of 0 to be sure contacts receive the message on the day of their BirthDate value. If no segment value exists: Select terminate the contact from the conversation, as you don't want to send to contacts without a BirthDate value. 18. To provide a coupon, click the Set Coupon Code step. 19. For a static coupon, select the update segment field with value option, select the coupon segmentation field, enter a value for a coupon code that works on your website. 20. For dynamic coupon pools, click here. 21. Click the Birthday Message 1 step. 22. Click Edit a Saved Message. 23. Select the Birthday Campaign Message that you created in the previous section. 24. 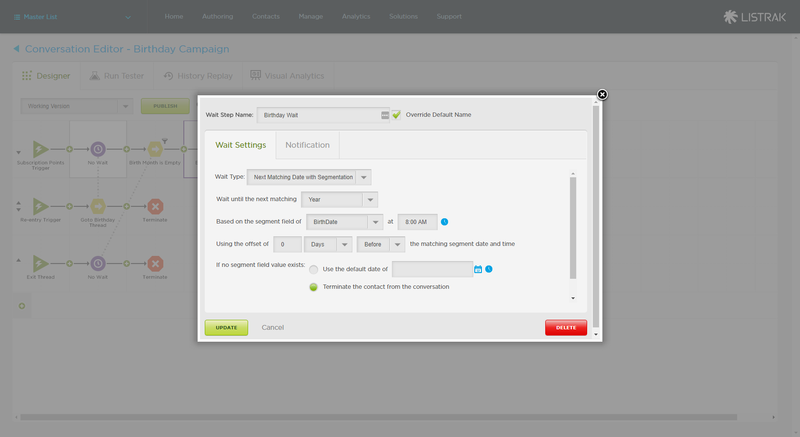 Navigate to the Analytics Integration. 25. Navigate to the Google Analytics Integration. 26. Enter Birthday for the Campaign Name. 27. Enter Message 1 for the Campaign Content. 28. 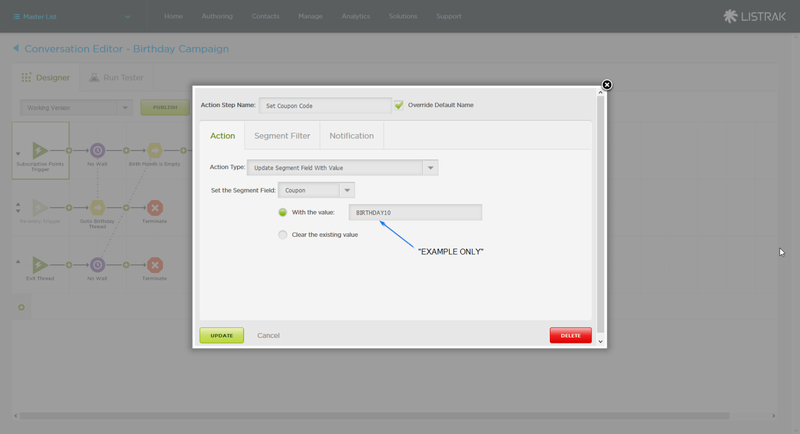 Navigate to the Listrak Conversion Analytics. 29. Select the Campaign Type to Birthday. 30. Enter Birthday for the Campaign Name. 31. Enter Message 1 for the Version. 33. Click Commit Message to the Conversation. If you'd like to enhance your Birthday Campaign, click here to learn more about adding your existing subscribers to this campaign.